There was a time, going on 25 years ago now, when El Bulli was just a simple seafood restaurant attached to a grotty camping site near Rosas, and when going to Spain for your holiday was considered a budget option. Prosperity came late to Spain in comparison to other European countries, and while France could boast a mature and exclusive fine dining culture and West Germany was a glittering consumerist paradise, my memories of the Costa Brava from the late 80s involved untarmacced dusty roads in the centre of reasonably large towns, electricity supplies that could best be described as "reluctant", and an attitude to service from anything from banks to corner shops that could ruin your day. Of course it's all changed now - Spain has more restaurants in the San Pellegrino top 50 than any other country in the world apart from France, the towns are spruced up and clean and efficient, and it has turned into a wealthy, modern European country. Now, I'm not the nostalgic type, and you'll notice I'm not looking back to late 80s Costa Brava with rose tinted glasses, but there are a couple of things I miss from 20-odd years ago. Firstly, and most obviously, are the prices. I distinctly remember a restaurant down the road from where we were staying doing a four-course meal for 1050Pts - about £4. It wasn't a particularly good meal - one of the courses consisted of boiled potatoes and green beans, and on one memorable occasion came garnished with broken glass (no refund was offered, not even an apology, they just swapped the dish - Health and Safety also being a post-1990 concept in Spain) - but if you were prepared to lower your expectations and put up with having your dishes flung at you by a guy in a string vest, you couldn't really complain. Secondly, before Ferran Adria started doing his foamy thing, restaurants in the Costa Brava tended to be either hushed, exclusive French-inspired places where the food was secondary to flummery and silver service, or seafront tourist traps where Brit-friendly menus served the odd Catalan dish in amongst chicken and chips and paella. Cal Galan, tucked away in an alley near the beach in L'Escala, is very much in that 2nd category, an unreconstructed tourist bar but one that has survived all these years by doing simple, tasty food very well and by virtue of its low prices and the odd Catalan speciality, is as popular with the locals out of season as it is with lobster-faced Brits in the height of summer. There's a certain charm in the way that Galan serves a good chunk of its menu with chips and the option of a fried egg. I know of very few cuts of meat that can't be improved by the addition of chips and a fried egg - it's something you don't see enough of. I'm also pleased to report that pig's cheek, slow-cooked to perfection in a deep, meaty broth, also goes very well with chips and a fried egg. Oh, and a beef tomato. It was there on the menu, and true enough my pig's cheek came with a sliced tomato. Straightforward, no messing about, pig's cheek, chips, fried egg, tomato. Sorted. And it was a beautiful pig's cheek, rich and tender and glistening with fat, and the chips were great for dipping in the egg yolk. A friend's chicken leg (also served with fried egg, and chips, and tomato) was simply grilled but moist within and similarly excellent value. Galan also do a pig's trotter (with chips, etc. etc.) which will be on my wishlist for next time as they certainly have a way with pork. With a bottle of the local Emporda Rosé, the bill came to around £10 each I think. Ludicrous value. The reason that places like Cal Galan only seem to exist in Spain (or at least, in the Costa Brava) is because they are so unselfconsciously naff while at the same time tasty and cheap that any other country would either have to double the prices and bring in the white tablecloths or alternatively go down the "authentic" route and serve worthy locally-sourced fare without the egg and chips. They're an anomaly I suppose, these seafront restaurant hangovers from the 80s, but isn't a Brit-friendly eggχps&paella joint in a way just as authentic in its own way as some asador in the Sierra Morena? None of them would have lasted this long unless they were doing something right, and traditions are created all the time - only the good ones stick around. I may be the only self-confessed foodie championing the clumsy comfort of a Costa Brava cafe with a multilingual menu but I can't help the fact I really enjoyed my meal at Cal Galan. Perhaps it was the combination of accessibility and shades of authenticity, or perhaps the cheap local wine and low lighting put me in the right mood. Or maybe, just maybe I'm a sucker for nostalgia after all. Bibendum wine competition - we have a winner! Congratulations to "samhill", who with his succinct entry "testes, testes, one, two .......three?" made me chuckle the most of all the comments on the Testi review. Please get in touch at the email address in the right hand column and I'll make sure your tickets are on their way soon. Many thanks to everyone else who took part, and if you want to go to the Bordeaux tasting under your own steam, email sales@bibendum-wine.co.uk, call 020 7449 4120, or visit the Bibendum website at www.bibendum-wine.co.uk/retail/events/BordeauxTasting. 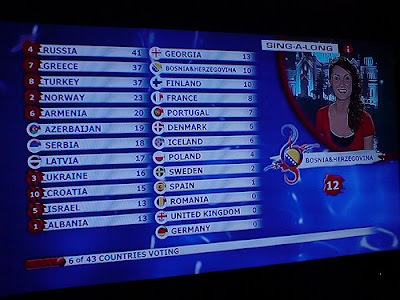 Although it had been an open secret for a number of years, 2008 marked the point where all pretence of the Eurovision finals actually being a competition about pop songs finally came to end. We've always had Greece and Cyprus voting for each other, but now it seems the whole of the ex-USSR are voting for their Russian ex-masters en masse, while the Baltic and Balkan countries participate in a similarly synchronized love-in. But now that Eurovision is no longer about the music, we don't necessarily have to resign ourselves to the fact that it is simply a political PR exercise. In the spirit of the original competition, created in order to foster cross-cultural understanding and forge friendships with our European counterparts, perhaps only thing for it is to find another common theme. The music is rubbish, the politics are depressing, but food - now that's something everyone can agree on. So here's a question. Can 25 food bloggers eat the cuisine of the 25 Eurovision finalists in 25 hours all within the M25? Not just find a local tapas bar or French restaurant though - really get to grips with the cultural heritage of food and the pride that ex-pats have in the cuisine of their country. That is the challenge that Andrew Webb, ex Channel 4 travelling foodie and freelance journalist, has set to the blogging community. He's asking for 25 foodies to agree to be randomly assigned a Eurovision country, then to go out into our nation's capital and see what food stories they can find. Already it seems he has persuaded the BBC to give the project some publicity from the Eurovision website, and this is looking to be a fantastic opportunity to see the best that this most multicultural of cities has to offer. So, if you're a foodie blogger that would like to get involved before the whole thing snowballs and becomes incredibly oversubscribed, sign up here. Then, rather than sitting at home watching miserably as Team GB pick up null points and some balding cheeseball with a ponytail and white suit walks off with the winning song "Ponky Ponky Bip Bip", you could be enjoying some of the best food in the world. And possibly even doing your bit for world peace. Not bad for an evening's work. 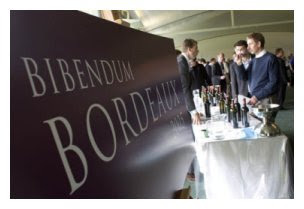 As a special treat for Cheese and Biscuits readers, wine experts Bibendum have very generously donated two free tickets to their Bordeaux tasting, on the 22nd April at Lord's Cricket Ground in St. John's Wood. The tickets are worth £50 and the event includes tasting of some pretty serious wines such as Chateau D'Yquem and Montrose, so it's well worth your while having a punt. In order to inject some fun into proceedings, I am going to give the prize to the person who leaves the funniest and/or punniest comment on my review of Testi, the Ocakbasi grill in Stoke Newington. Have as many goes as you want, but make sure you watch this space around 15th April, when I'll be announcing the winner. I don't want all your hard work going to waste. Please also bear in mind that the event is held from 4pm-8pm so those of you who have a day job may want to leave work an hour or two early to make the most of it. But I can't think of a better excuse to bunk off a Wednesday afternoon than to go and taste some fine vintage wines in North London. To buy extra tickets or if you just want to guarantee a spot, email sales@bibendum-wine.co.uk, call 020 7449 4120, or visit the Bibendum website at www.bibendum-wine.co.uk/retail/events/BordeauxTasting. 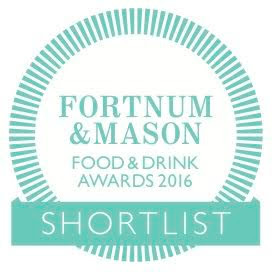 Trade tickets are available as well – please contact Bibendum on 020 7722 5577 for more info.